Termites may seem to have no rhyme or reason other than just destroying your home and everything made of wood in sight. But they are actually governed by a very strict caste system, just like what many people had in days (not so long) gone by. The caste system includes the king and queen termites, soldier termites and worker termites. Understanding the caste system and how each of these classes interacts is key to developing an effective termite prevention program and to getting effective termite treatment. The worker termites are those you are most likely to see if you find termites in your home, such as around damaged beams. They are the termites that do most of the eating and most of the damage. Just as their name suggests, soldier termites are responsible for defending the colony. Soldier termites are bigger than worker termites, and they have a uniquely shaped, darker head with large pincers. They use these pincers to attack other pests that enter the colony, such as ants. They will bite humans if they are handled, but they do not typically seek out people to attack them. If you have termites in your home, you likely wouldn’t know it until the damage became obvious. You wouldn’t wake up in the night with mysterious bites. The large, powerful jaws on the soldier termites make them great defenders for the colony, but they also make it impossible for the soldiers to feed themselves. They have to be fed by the worker termites, just like children. Besides their large pincers, soldier termites have other options for defending the colony. In some species, soldier termites use their large heads to block tunnels that predators might use to enter the colony. In some species, soldier termites can emit a defensive secretion. These secretions can have a foul odor, or they can be sticky and poisonous. Mandibulate soldier termites use their jaws to attack, and nauseate soldier termites use secretions to attack. Identifying what type of soldier termite it is can help identify the species of termite. Soldier termites are unable to reproduce, and they are blind and wingless. Soldiers are much smaller in number than workers, and they only live for one to two years after they have entered the adult stage. Termites turn into workers, soldiers or queens through a series of molts when they are nymphs. Soldier termites typically have an elongated body when compared to workers, and they can be pale red, light brown or white. Queen termites are primarily responsible for all egg production in the colony. The queen and king are the only fertile termites in the whole colony, and the queen and king mate for life. When the nymphs become of reproductive age, the king and queen leave the parent colony to start their own colony. They drop to the ground and shed their wings once they find a nesting site, and they begin reproducing. A nesting site must include plenty of moisture and decaying wood to serve as food for the growing colony. That’s why it is important to keep decaying wood away from your property so as to minimize the likelihood that a new colony will form near you. Once a colony is established, the queen only lays eggs. When the colony is still young, the queen and king take on the responsibility of caring for the larvae and nymphs. A queen can lay an egg every 15 seconds, and she lays thousands of eggs per year. The queen’s abdomen will swell in a process known as physogastrism, creating room for all the eggs that must be laid to keep the colony thriving. In some species, queen termites will lay eggs only during certain times of the year, which results in huge swarms of winged alates when they have their nuptial flight. The queen can live for 15 to 25 years, though some queens have been found to live as long as 50 years in the right conditions. Toward the end of her life span, the queen will start laying fewer eggs, and neotenics will assist her in reproduction. One of those neotenics will become the new queen when the current queen dies. That’s why you can’t kill a colony just by killing the queen. It is important that you hire a termite exterminator in Glendale who understands how the termite caste system works to select the best termite treatment to eradicate the colony. Knowing how these colonies form can also help you put the right termite prevention measures in place. 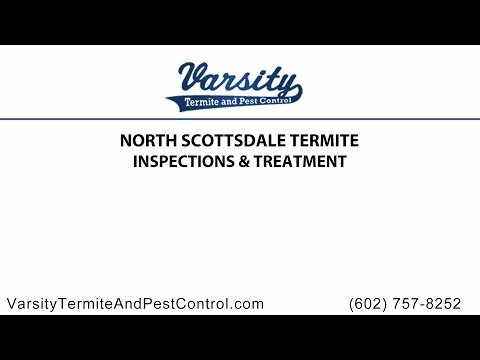 Varsity Termite and Pest Control has been providing effective termite treatment for residents of Arizona for many years, and we have the knowledge and skill to get results for you. We’ll conduct a termite inspection in Glendale to determine the location of the colony, how termites are getting into your house, the spread of the termite infestation in Glendale, and more. We’ll then determine the right termite treatment to get the fastest results and help you come up with a termite prevention plan to minimize the risk of a new infestation. Call us today to schedule a free termite inspection and to discuss your termite treatment options.